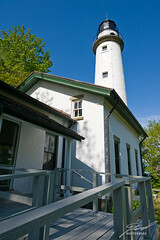 While out on a Geocaching trip across the tip of the thumb we stopped at the Pointe aux Barques Lighthouse just after the scheduled closing. Lucky for us the museum was still open and we had a chance to take a quick tour. I look forward to hitting the site again both for better photos and to spend some time in the museum. The light was such that I wasn't able to get any good shots (I should have set-up the tripod and popped an HDR but was having too much fun playing with the new 14-24mm lens) and we had to skate pretty quickly to get back to Port Huron by dark. I'm thinking that a fall morning would be best for that next visit.